If you plan to provide mediation services, mediation training services or expertise to clients, then you may need to be certified. Also, some insurance companies that provide liability insurance require you to be certified. If your certification lapses, your insurance may lapse as well. But, what if I don't ever plan to provide services to clients? Then, it's not necessary to receive certification. However, being a certified mediator and/or certified mediator trainer provides you with a comprehensive training background which you will need in everyday problem solving. What steps do I need to do to get certified or recertified? Pay for the required examination. Within 24 hours of enrollment, you will receive a login and password to access the certification prep manual and certification examination. You will have 30 days from the date that you have paid to take the certification examination. The exam is automatically graded and the results are returned to you immediately. A certification card and certificate will be mailed to you within two weeks of successfully passing this test. What if I don't complete the course in 30 days? You can contact us for your examination to be reset. There will be an additional fee of $99 to reset the examination. Why isn't there a practical test or role-play requirement? A 1-2 hour role-play is not indicative of mediation ability. Employers know this, that's why they ask new mediators to co-mediate or be observed during their first mediation sessions. Being certified doesn't necessarily mean you are ready to mediate disputes. It takes working with a senior mediator as an apprentice to become skilled at mediation. This is why we recommend working with another mediator if you are a new mediator. This is standard industry practice anyway. We are probably the only organization that readily admits that we only certify your academic credentials. Anything more is assuming too much. As with any certification, degree or diploma, the real learning process comes in mediating on the job and working with an experienced mediator. The hiring official is responsible for hiring and is therefore in a position to determine if a person who has the academic credentials (certification) can also demonstrate the skills, personality and outright mediator ability to be on the staff. These cannot be measured in a written test or in a 1-2 hour role-play exercise. Is NACM recognized by all mediation programs/employers? Many mediation employers have NACM on their accepted list. However, it's always good to call them first and check before you certify with anyone. Some employers may have a preference list or accept only one organization. It is becoming rare, however, for this to be the case. Is the mediator certification for a Certified Mediator in Family, Divorce or Business? All of them. Our certification is designed to provide the basic knowledge that we feel a Mediator should have. Many mediators are asked very technical questions about mediation and it processes in any of these areas. In essence, a Certified Mediator, by our definition, should be able to handle all three of the above areas. A professional certified mediator should be knowledgeable in all three areas of mediation with a general understanding of motivational psychology. Are CEUs required for recertification? We don't require CEU's for recertification. You pay the same amount to re-certify. You'd pay more on the CEU plan, however, we also don't feel that a single course every two years satisfies the educational growth requirements. The learning process should be self motivated and continuous. Educational sources are numerous, books, trade magazines, the internet, ESPN, Discovery, The Learning Channel, and formal University courses or classes. What is required for recertification? The recertification process is the same every two years. You simply pay for and download the Mediation Prep Manual and examination, take the test on the website and pay the same certification fee on the website as well. How long will it take to get my certification card? It depends on where you live. Most North America locations take anywhere from 3 days to 5 days to arrive. We ship your card within 2 weeks of payment and passing of your exam. If you are overseas, most locations require an additional week to 10 days. If you are in a country with known mail delivery problems, it can take longer. Contact us by email at support@mediatorcertification.org for special instructions if that is the case. The most frequent reason for delay is missing apartment number. Can I get a certificate also? Yes. The payment option provides Certification Card & Certificate by Priority mail. How can I pay for the certification? You can pay for your certification by clicking on the Certification Test tab. What steps do I need to do to become an accredited mediation program? Pay for the application. Please contact NACM 3 weeks prior to providing the 40 Mediation Training Course. NACM will send you all required testing materials/instructions for testing. Send your SER with all supporting documents. How do I pay for my employees? If you fail the test, look over the results and note the areas that you were weak in. Read those sections of the Preparation Manual again and retake the test. We only keep the highest score. Theoretically, there are no limitations. However, if you find yourself taking the test too many times you may be learning from test taking rather than learning from reading the Prep Manual in which case you are missing many important aspects of what a mediator needs to know. There is examination abuse protection in place. Can you send me a copy of the Mediation Prep Manual? Yes, we can for an additional fee of $69.00 this includes shipping and handling. I'm not comfortable with paying on-line. Can I phone it in? You also have the option of mailing in a check. Giving your credit card number over the phone is much less secure than the internet. We use the highest encryption available as do the banks. There is no encryption on your phone land line or cordless and very little on cellular. It's not the transmission of that information on the internet that is unsafe, it's who you are giving it to. Deal only with reputable vendors whether on the internet, phone or in person. Is NACM's certification valid in my country? We are currently in over 80 countries around the world. You should not have a problem but check with local requirements. Is the Mediation Prep Manual available in another language? At this time it is only available in English. Why can't I get my credit card approved? The most common reason for a declined card is using a different zip code or address than the billing statement is sent to. In some cases, it's your bank that doesn't like internet transactions. If your computer location is in a different part of the country than the address on your statement, it will be disapproved. In that case, choose another payment method. 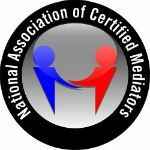 NACM's Mediator certification is a combined certification that provides the academic qualifications needed to provide mediation services. The Train-the-Trainer Course will allow you to teach mediation skills to other individuals. Can you detect test answer sharing? Yes. Our software uses the same AI concepts as the US Defense industry. If our multi-layer detection systems flag improprieties in the testing process we will take the appropriate action. This is also true if we detect improprieties in the hosting process. We have rejected tests on that basis in the past. No system is identity foolproof even a test that is proctored. However, if we are made aware of an impropriety in the testing process, that certification will be revoked without refund and you will be barred from future certification with NACM. Can I use a designation after my name once certified as a Mediator or Mediator Trainer? When referring to the mediator certification, please make sure to use “National Professional Certification in Mediation”. You may say that you are a “Nationally Certified Professional in Mediation”, thus you may use the initials NCPM after your name to identify your credentials. This is the only appropriate representation of the certification. What if I already have a 3 year certification? As of January 1, 2014 new guidelines will be in affect for the recertification process. What is the minimum age for certification? The minimum age to receive a certification card from NACM is 18. This is for insurance purposes. Where can I get an NACM logo for my business cards? Email us at support@mediatorcertification.org and the logo will be emailed to you. Why would I want to become an accredited mediation program? Becoming an accredited mediation program will allow for your program to be more recognizable nationwide and also l the opportunity grows to increase income. What is the purpose of your 40 Basic Mediation Course? To give those who haven't been properly trained in mediation or those who are new to the mediation profession the proper learning tools to advance in the mediation world.